3 Gloucester is located on the east side of Gloucester, between Beacon and Marlborough, with 1 Gloucester to the north, across Alley 416, and 5 Gloucester to the south. 3 Gloucester was designed by architect Frederic H. Moore and built ca. 1873, one of three contiguous houses (3-5-7 Gloucester) with brick façades. 3 and 5 Gloucester were both built with three stories plus basements. 7 Gloucester either was built with four stories plus a basement or was remodeled soon after it was built to add a fourth story (it is shown as one story higher than 3-5 Gloucester on the 1887 Sanborn map). 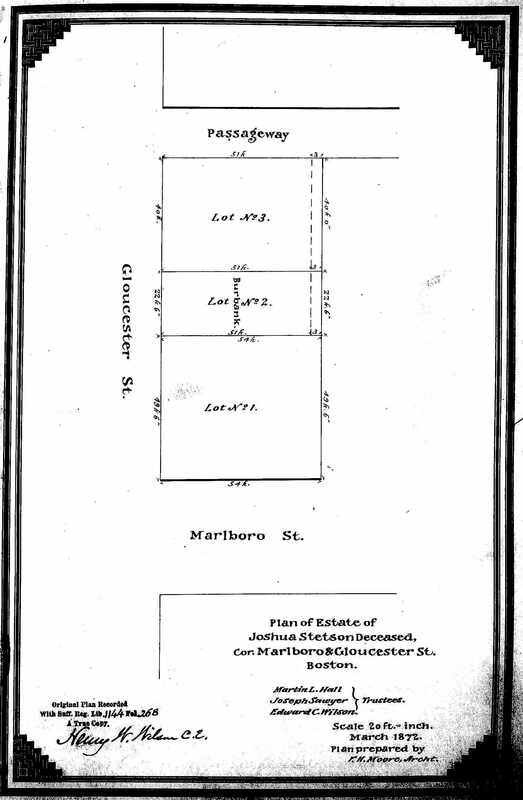 The original deeds for 3 Gloucester and 5 Gloucester included easements at the rear of the properties providing for a three foot passageway to permit passage and drainage from 3-5-7 Gloucester to the alley. When the owners of the houses purchased the additional three feet of vacant land adjoining 323 Marlborough, they also agreed to move the easement three feet to the east, so that it remained at the eastern edge of their properties. Click here for an index to the deeds for 3 Gloucester. On July 23, 1873, James Henry Read, treasurer of the Boston Ice Company, purchased Samuel T. Ames’s half-interest in 3 Gloucester, and on September 28, 1874, he purchased the remaining half-interest from Frederic Moore. James Reed and his wife, Martha Ann (Wesson) Reed, made 3 Gloucester their home. They previously had lived at 64 West Cedar. The Reeds’ three children – James Henry Reed, Jr., Martha Houghton Reed, and Katharine S. Reed – lived with them. Katharine Reed married in January of 1890 to John R. Bradlee. Prior to their marriage, he had lived at 113 Beacon with his parents, John Tisdale Bradlee and Sarah Elizabeth (Goddard) Bradlee. After their marriage, John and Katharine Reed lived in an apartment at 52 Hereford. Martha Reed married in May of 1893 to Charles Anthony Morss, Jr. Prior to their marriage, he lived at 323 Marlborough with his parents, Charles and Mary Elizabeth (Wells) Morss. After their marriage, Charles and Martha Morss lived at 6 Gloucester. Martha Reed died in February of 1896, and James Reed died in October of 1896. After their deaths, James Reed, Jr., moved to 6 Gloucester to live with Charles and Martha Morss. On March 23, 1897, 3 Gloucester was purchased from the Reeds’ three children by attorney Thomas Russell. He and his wife, Laura (Parks) Russell, made it their home. They previously had lived in an apartment at 409 Marlborough. 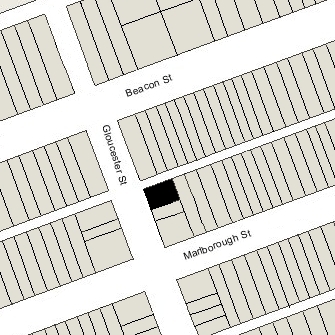 The Russells continued to live at 3 Gloucester during the 1918-1919 season, but moved thereafter to 277 Clarendon. On June 9, 1919, 3 Gloucester was purchased from Thomas Russell by Charlotte (Hemenway) Denny, the wife of by Dr. George Parkman Denny, a physician. They previously had lived at 273 Clarendon with her parents, Augustus and Harriet (Lawrence) Hemenway, while he served in the US Army medical corps. Prior to that, they had lived at 285 Marlborough. 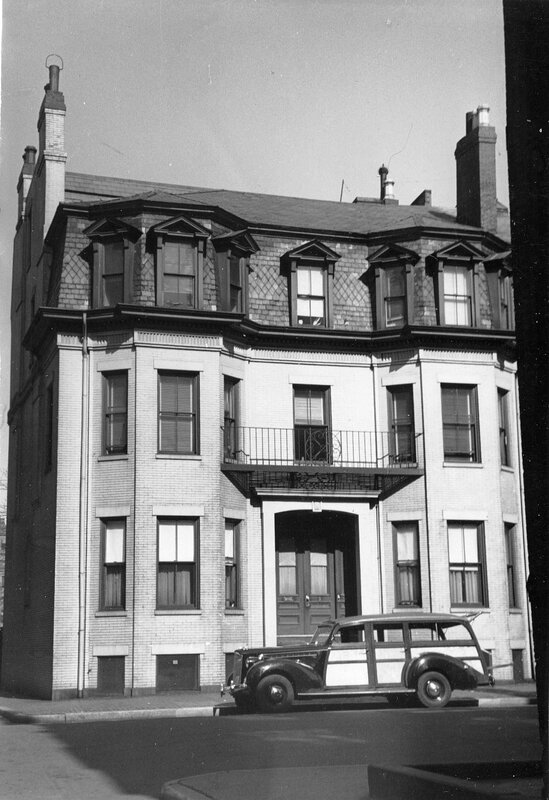 Dr. Denny initially maintained his office at 3 Gloucester, but had moved it to 66 Commonwealth by 1925. They continued to live at 3 Gloucester until about 1937, when they moved to an apartment at 65 Commonwealth. They also maintained a home in Manchester, Massachusetts. On July 3, 1937, 3 Gloucester was acquired from Charlotte Denny by Virginia (Wilson) Lavalle, the wife of John W. Lavalle, Jr. He was a portrait and landscape artist with a studio at Fenway Studios at 30 Ipswich. John and Virginia Lavalle had married in September of 1932. After their marriage, they had lived in Cambridge and then at 353 Marlborough with his mother, Alice Cornelia (Johnson) Lavalle. His four children by his first marriage, to Ellen Tufts (who died in January of 1932), lived with them: Alice Lavalle, Mary Dean Lavalle, John Edward Lavalle, and Ellen (Elaine) Lavalle. On May 7, 1935, while he was in New York exhibiting his art and Virginia Lavalle was in Cincinnati visiting family, 353 Marlborough was destroyed by fire. His mother and daughter, Alice, were killed, and his daughter, Mary, subsequently died of injuries from the fire. His two younger children, John and Elaine, survived. In August of 1935, John and Virginia Lavalle’s daughter, Virginia Wilson Lavalle, was born. In August of 1937, John Lavalle applied for (and subsequently received) permission to add a fire escape to the rear of 3 Gloucester (the house at 353 Marlborough had neither a fire escape nor fire balconies). John and Virginia Lavalle divorced in the mid-1940s and he moved to New York. Virginia Lavalle continued to live at 3 Gloucester. Her daughter, Virginia, and probably her step-son and daughter, John and Elaine, lived with her. Virginia Lavalle also accepted lodgers, among them (from about 1946) was Millard B. Gulick, an architect. He previously had been a lodger at 116 Marlborough. He continued to live at 3 Gloucester until his death in March of 1956. In February of 1950, Virginia (Wilson) Lavalle married again, to Huntington Wolcott Frothingham, principal assessor of the City of Boston. After their marriage, they lived at 3 Gloucester. They continued to live there in 1956, but had moved to an apartment at 308 Commonwealth by 1957. She continued to own 3 Gloucester and lease it to others. In 1956, 3 Gloucester became the home of Dr. Girolamo Vitelli, consul general for Italy, and his wife, Maria Giula (Senni) Vitelli. They previously lived in Belgrade, where he had served in the Italian embassy. They continued to live at 3 Gloucester until the fall of 1958, when he was appointed to the Italian mission to the United Nations and they moved to New York City. Virginia Frothingham died in 1958, and on October 29, 1958, 3 Gloucester was purchased from her estate by real estate dealers Stuart H. Hastings and Joseph A. Gautreau. In November of 1958, they applied applied for (and subsequently received) permission to convert the property into eleven apartments. The previous use is stated as “apartments” which appears not to have been the case. On July 30, 1959, 3 Gloucester was acquired from Stuart Hastings and Joseph Gautreau by Willis Frank and Sherman I. Frank, trustees of the Willshire Realty Trust. 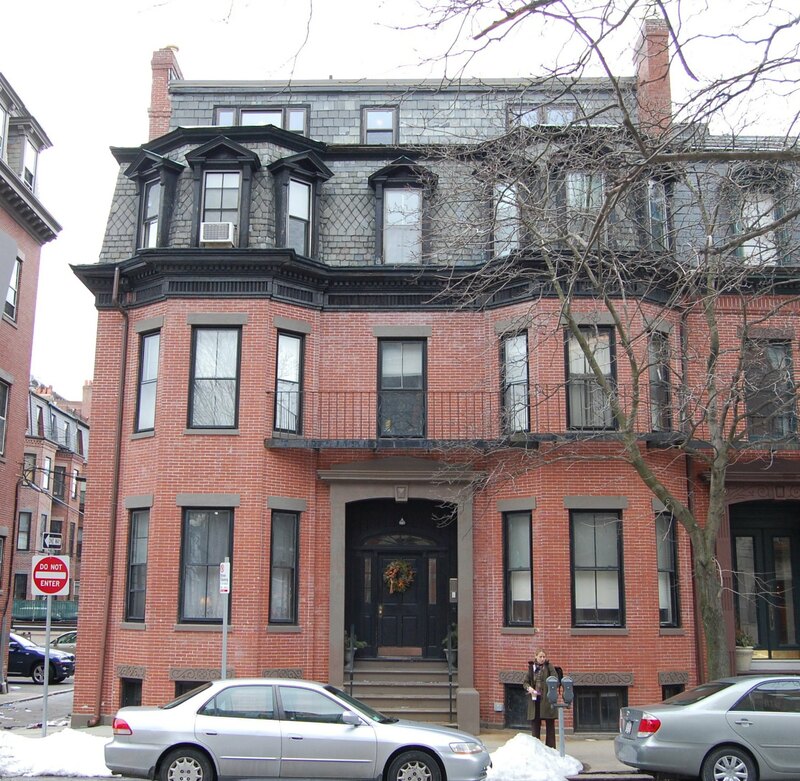 The property changed hands and on August 1, 1978, was acquired by Robert I. Weisberg and R. Bruce MacDougall, trustees of the Three Gloucester Street Realty Trust. 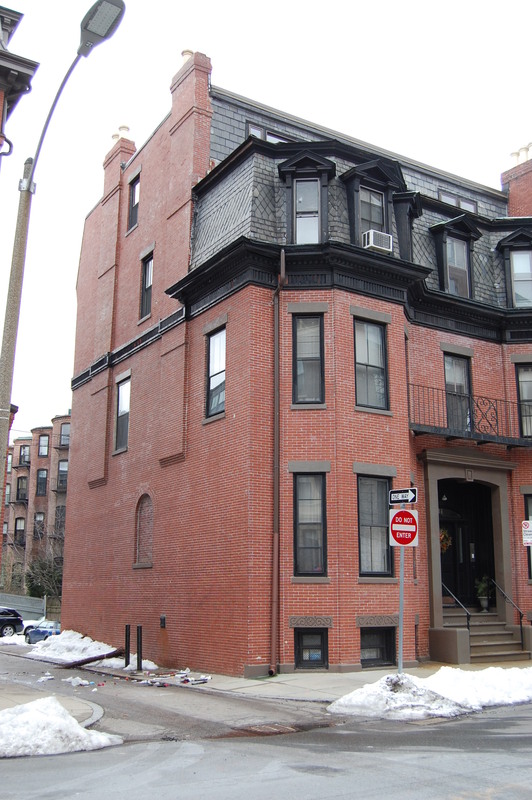 On September 15, 1981, Paul G. Roiff, successor trustee of the Three Gloucester Street Realty Trust, converted the property into eleven condominium units, the Three Gloucester Street Condominium.